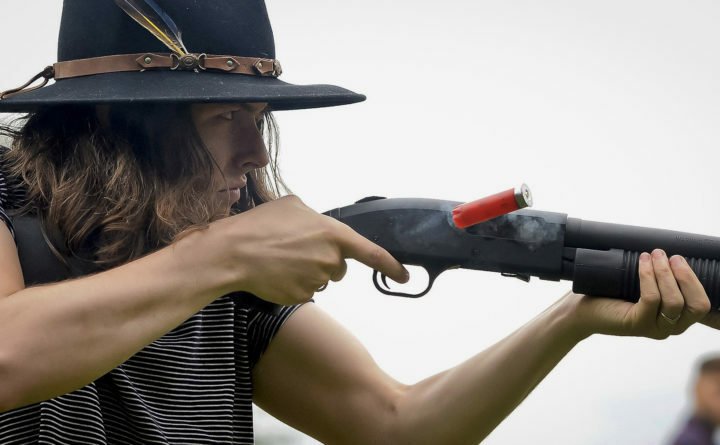 In this Oct. 8, 2017, photo, Jon Dumont reloads and shoot a shotgun during a training session for the Trigger Warning Queer & Trans Gun Club in Victor, New York. A gay, lesbian and transgender group concerned that extremists have become more emboldened and dangerous have decided to take up arms. The gun club meets once a month to shoot long guns in a field in upstate New York. ROCHESTER, New York — The former pacifist pumped a shotgun at the firing line. “I identified as a pacifist really through most of my life,” McSpadden, 37, who has attended a self-defense seminar and now owns a 20-gauge shotgun, said. The light mood belies the apprehension that led to group’s creation this past winter amid a year marked by politically tinged violence ranging from scuffles at protests to a violent clash of white supremacists and counter-protesters in Charlottesville, Virginia. The National African-American Gun Association gained 500 new members within two days after Charlottesville. Association president Philip Smith said the group went from four chapters to 45 in the past year. The Liberal Gun Club, a national organization, has seen its paid membership roughly double since the election to about 5,500, Lara Smith said of the group’s California chapter. So-called leftists see the country differently now than the days of Occupy Wall street six years ago, according to Mark Bray, author of “Antifa: The Anti-Fascist Handbook” and a visiting scholar at Dartmouth College. Trump’s victory emboldened white supremacists, he said, and the threat is felt not just by the LGBTQ community, but people of color, immigrants, Jews and Muslims. Associated Press writers Nicholas Riccardi and Dake Kang contributed from Denver and Cleveland, respectively.